Welcome to our section on lake fishing tips. This page was developed to help fishermen improve their skills for fishing in a lake. 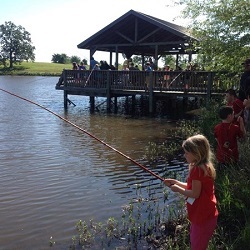 It doesn’t matter how long you have or haven’t been fishing, the information provided on this page will improve your success at lake fishing. We start off by educating you about the basics of lake fishing, then give you some of the most effective lake fishing tips that were available to us. We end this page with some lake fishing safety tips to help ensure you don’t have any issues when you’re fishing along a lake shore or out on a lake. Lake fishing is when you fish a body of water that is classified to be a lake. A lake is classified as a body of relatively still water that is almost completely surrounded by land with a river or stream that feeds into it or drains from it. A lake that has fish that you can catch can either be man-made or natural, with natural lakes tending to have more successful results. 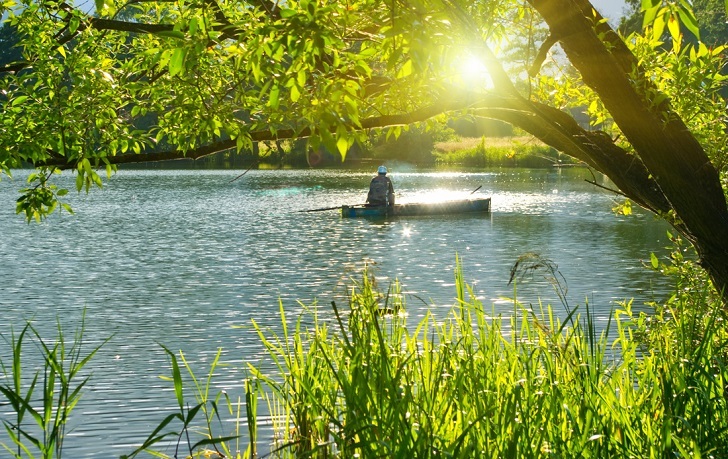 Depending on the size of the lake and where it’s located, you may or may not be able to use a boat when fishing. If you can use a boat you may be limited to just a trolling motor. 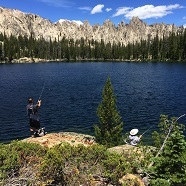 Many lakes in the United States have sustained fish populations due to stocking programs by county or state agencies. There is not an international standard used to define the difference between a lake and a pond. Many people believe the difference between the two can either be size, how water is fed into it or a combination of both. Just because lakes are land locked doesn’t mean they are all freshwater. A lake can have a high concentration of salt, two examples are the Great Salt Lake and Lake Urmia. Depending on the concentration of salt, fish may or may not be able to survive or reach sufficient size to be worthy for fishing. Lakes, just like ponds, rivers and all other bodies of water will have creel limits. A creel limit is the amount of fish and/or size of fish you’re allowed to remove from that lake per day. Are you ready to get out on the lake and catch some fish? Before you go you might want to read and use some of our lake fishing tips below. While these won’t be specific to any certain fish species, they can be used in combination with our fishing tips to make you a more skillful angler. Inlets and Outlets are your Friend – Like humans, fish like specific temperatures and will generally hang around areas of a lake that they find comfortable. Places where water enters or drains from a lake will generally be much cooler and favorable to fish. Bait fish like to hang around these areas, along with the big monster fish that eat them. Choose the Right Bait – You can’t go wrong with natural freshwater bait such as cricket, worms, minnows, and leeches. Live bait can also be quite affordable. For example, Amazon has a great deal on live crickets. For artificial lures, we recommend fishing jigs. They are the most versatile in lakes because they can catch just about any type of freshwater fish. Our brand of choice is the Terminator Pro’s Jig. As the Heat Index Rises – The hotter it gets outside the deeper you’ll need to fish. This is because fish tend to like cool temperatures and will retreat to deeper, cooler water as the temperature outside rises. 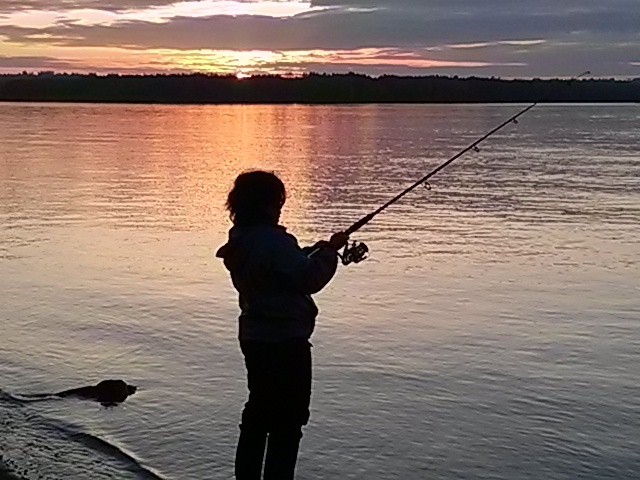 During dusk and dawn fish will come to more shallow water to feed, some more shallow than others. You should research the specific type of fish you’re trying to catch in order to learn more. Find Sunken Structures – Fish like to hang around structures that make them feel safe and that provide the opportunity to ambush other fish. Structures such as downed trees, branches and even man-made fish habitats are a great place to fish. Look for Weeds – A lot of big fish, like largemouth bass and northern pike, like to ambush their prey from a nice comfy weed bed. Locate some weed beds in the lake your fishing in and try getting your bait and/or lure in that area to see if you can coax a fish to bite. The weed beds that lead to deeper water and create a break line are the best honey pots. Work with the Wind – On days with a strong breeze you can expect the bait fish to get pushed closer to shore, meaning the big fish will come closer to shore to feed. Watch for drift lines and follow them, they will lead to bait fish, which will in turn lead to big fish. When fishing on a lake it’s important to always wear a life vest and follow all local and state regulations when boating on that lake. If you plan to fish from shore and wade into the lake make sure you use a wader belt to prevent water from rapidly filling up your waders in case you fall. Make sure not to leave behind any hooks where you fish or near the shore of the water, they can hurt wild life, domestic pets and even other people. Remember, we share our lakes with fish, wildlife and other humans, so keep them clean and don’t leave or toss garbage in the lake.